The long-awaited Noah is finally in movie theatres. Russell Crowe plays the biblical patriarch for whom God has assigned a special task: build a gigantic wooden boat, an ark, and place on it (or, according to the movie, allow them to come voluntarily onto the boat) one pair, male and female, of every animal on earth (everything that crawls, flies, walks or slithers, including snakes because they serve a purpose). Noah has a wife, Naameh (played by Jennifer Connelly) and three sons (Ham, Shem, and Japheth). God is disappointed in man and is sending a flood to wipe out every living thing on earth. Only Noah, his family (including his sons’ wives), and the animals on the boat will survive, the idea being that they will start afresh after the flood waters have receded. God has chosen Noah because he is a righteous man and hasn’t been “ruined by the world,” as, it seems, everyone else has. 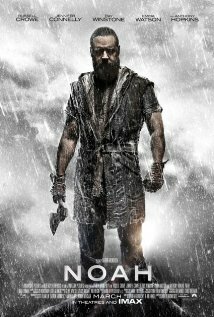 Anyone expecting a faithful adaptation of the biblical story of Noah is going to be disappointed by this movie. While it is a slick and well-crafted piece of cinema, it’s a fictionalized account. Not enough is known about Noah to make a dramatic two-hour-and-fifteen-minute movie, so the filmmakers have had to improvise, creating events and people that never existed. For example, the wicked world is represented by the fictional character, Tubal-cain (Ray Winstone), who wants to live so badly that he stows away on the ark and is aided and hidden by Noah’s son, Ham, who is taking revenge on his father for not saving a girl he liked from the trampling hordes who were storming the ark. While Noah and his family are on the ark, waiting for the flood waters to recede so they can once again walk upon dry land, tensions arise over the question of whether man will continue after Noah and his family are all dead, or if the world will be another unspoiled Eden in which only animals will live without the wicked and evil man to spoil everything. Noah is all for letting man die out with them, while his wife wants their children to live on in their own descendants. When Shem’s young wife, Ila, who is supposed to be unable to bear children, discovers she is going to have a baby, Noah vows to kill the baby unless it’s a boy. While Noah is worth seeing, it’s not worth taking seriously. It’s entertaining in its way but no more believable than movies about hobbits. When the “Watchers” (fallen angels, who, as punishment from God, have become huge beings made of rock and mud) first appear early in the movie, you know you are in the realm of fantasy and not in a world that anybody is supposed to believe exists or ever existed.